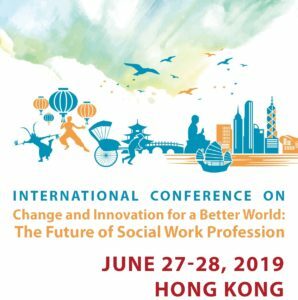 To celebrate the 70th anniversary of the Hong Kong Social Workers Association and the Department of Social Work and Social Administration at The University of Hong Kong, we are co-organizing an international conference on “Change and Innovation for a Better World: The Future of Social Work Profession” on June 27-28, 2019 at The University of Hong Kong, Hong Kong. The conference is supported by our sister departments in The Chinese University of Hong Kong, The Hong Kong Polytechnic University, City University of Hong Kong and Hong Kong Baptist University, as well as the Hong Kong Association of Schools of Social Work and The Hong Kong Council of Social Service. It is an opportunity to celebrate and reflect upon the achievements of the past 70 years and to contemplate and plan for the future of social work profession in this rapidly changing world. We envision a joyous celebration and a fruitful exchange in the Conference. On behalf of the Organizing Committee, we are inviting social work researchers, educators, and practitioners to share their recent works in presentations and workshops in the conference. We welcome presentations of recent research findings and innovative practices in social work and related topics. ALL submissions will be reviewed by our abstract review committee. More detailed information on abstract submission can be found in http://www.changeinnoconferencesw.hk/call-for-abstract/. Please also visit our Conference website for the conference program and information: http://www.changeinnoconferencesw.hk. Meanwhile, we shall appreciate your kind support to share the information of our Conference with your colleagues and friends. Please join us to celebrate our 70th anniversaries by sharing your research and wisdom in social work practice and innovation. We look forward to your participation in the Conference in June 2019.